Gel pens used to just be a fun way to take notes in class, write a grocery list, or address party invitations. But believe us when we tell you that they’ve come a long way. We’ve researched some of the best-selling products to help you find the best gel pens. Before we get into our reviews, let’s take a look at the features you need to know to choose the right ones for you. Retractable: Retractable pens don’t necessarily write any better than other pens but it does save you from having to put a lid on. This is important with gel pens. They shouldn’t be exposed too long after using them because they dry out quickly. 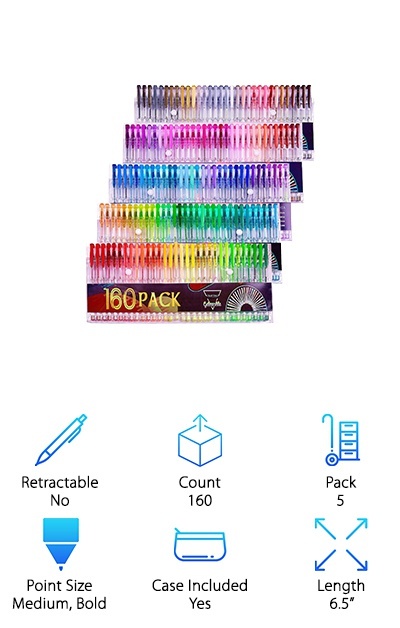 Count: You’ll be surprised at how widely the count ranges when it comes to gel pens. If you’re looking for a lot of different color options for your next art project, you’ll find some packs with up to 100 different colors! Pack: Some of the larger sets come divided into different packs. Like, you’ll find a glitter and metallic pack or a neon pack or a glitter neon pack. It’s a great way to keep large sets somewhat organized. Point Size: The point size you need for your gel pen depends on what you want to do! Bold pens are better for coloring, fine tipped are great for writing and detail work. Medium can be used to do pretty much anything. Case Included: Cases are a great way to keep your pens organized. In fact, we’ll go so far as to say that they’re necessary for large sets. 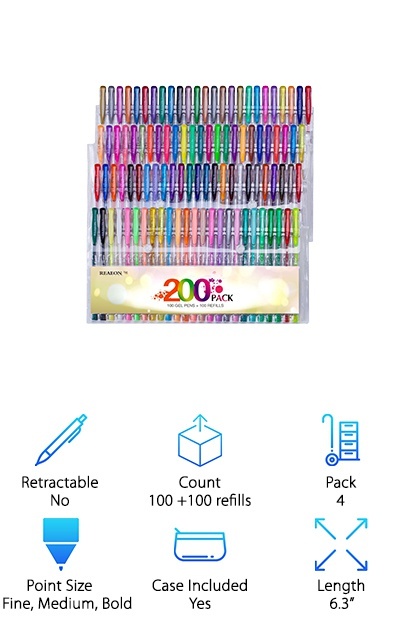 After all, you may have 100 pens! You need somewhere safe to keep them. Length: These pens vary in length slightly but they’re all full sized. No mini pens here! Retractable pens are usually a little shorter than other pens only because they don’t have a pen cap to account for. Whether you’re looking for the best colored gel pens to write in your bullet journal or color in your mandalas, you’ll find the perfect fit here! Everything from glitter to neon to metallic. Now that you know what to look, let’s get right to our gel pen reviews. Here’s the deal: we named a top pick and a budget pick. That’s the best place to start if you’re in a hurry. Now, let’s get to our top ten products! These aren’t your average gel pens. 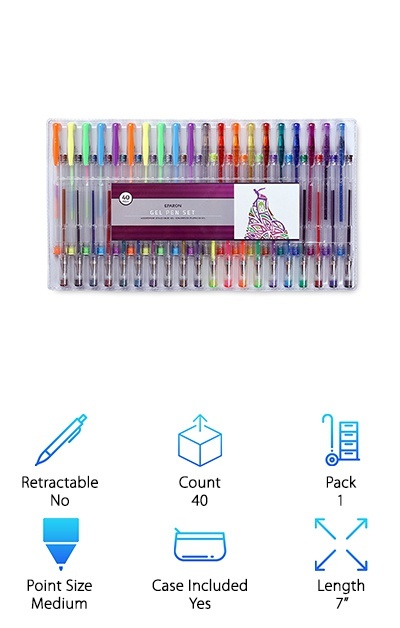 This best quality gel pens set was selected by artists to encourage people to think about using gel pens in new ways, beyond just writing. To do this, the came up with some pretty awesome colors. This set includes a variety of different inks, including glitter, metallic, neon, pastel, glitter neon, and swirl. They also hit places on the color spectrum that most other gels pens don’t. What does that mean? You can add more contrasts and depth to your art. The pigments are great and the fine and medium tips use just the right amount of fade-resistant ink. No need to go over your lines again and again! Colors Gel Pens get it right the first time, with a crisp clean line. If it’s glitter pens you’re after, you’ve found them. 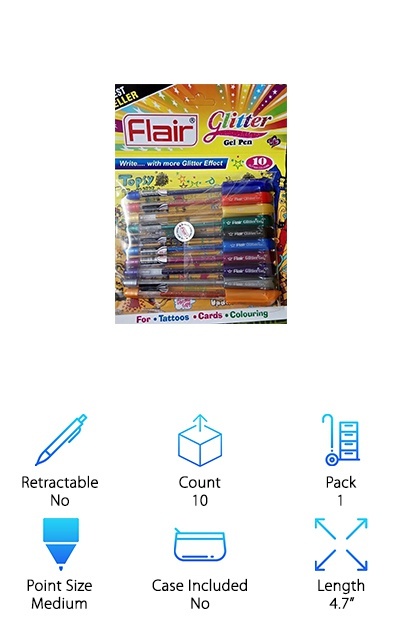 These Flair Xtra Sparkle Glitter Gel pens definitely deliver. The ink flows out of the tip smoothly and evenly. You even get enough color the first time without having to go over your work. The medium tip allows the ink to flow freely without smudging. That’s because these pens are meant for coloring and other artwork, although they’d certainly make any written work look amazing. The glitter is pretty impressive, too, with extra sparkles to let your creativity shine. Unlike some other glitter gel pens, you can see the glitter in the ink even after it dries. These are really the best glitter gel pens we found. The 10-pack comes with black, red, pink, orange, yellow, purple, silver, green, dark blue, and light blue. These might be the best gel pens for coloring because there are just so many colors to choose from! 160 different colors with no repeats. The non-toxic, acid-free ink is good for all ages and a range of projects. That said, they were made for adult coloring books. Think about how much depth and shading you’ll be able to add to your pictures with this many colors to choose from! The tips range from medium to large so you’ll be able to get both fine details and easily color in larger areas. The ink in this pen comes out really smooth and lasts longer than most other gel pens. And get this: it dries quicker, too. No more smudges! 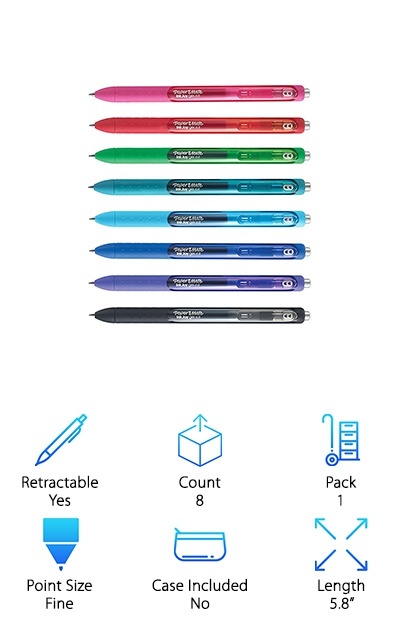 These pens come in a range of styles, too, including neon, pastel, glitter, metallic, and multicolored. 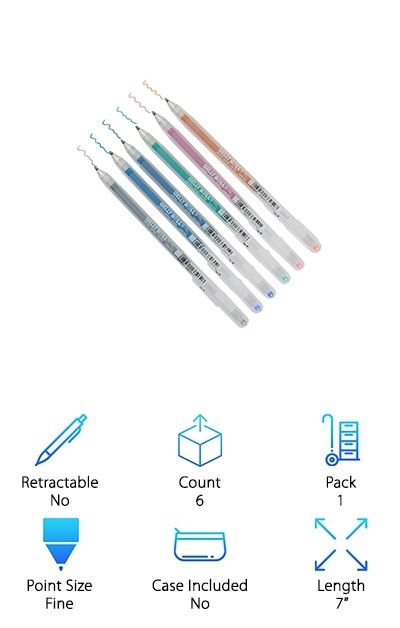 If you want a nice size gel pen set that has enough variety so you can make amazing art while still being small enough that it’s easy to carry around, check out this Eparon Gel Pen Set. You get 40 saturated colors in nice a variety of different styles, including neon, mixed pastel, solid pastel, glitter, and metallic. It’s actually a really nice mix! The medium tips give a smooth and even application and the ink comes out really smoothly. Guess what else? Not only is the ink smooth and bright but it’s also so bold that you can even use some of the lighter colors to write on black paper! That’s how you know that these are some of the best quality gel pens. They’re smooth, vibrant, and will last a long time. Most gel pen lovers will tell you that the one problem with them is that they just run out of ink so fast. This isn’t really a flaw in the pen - it’s just that people love to use them so much, they run out before you know it. 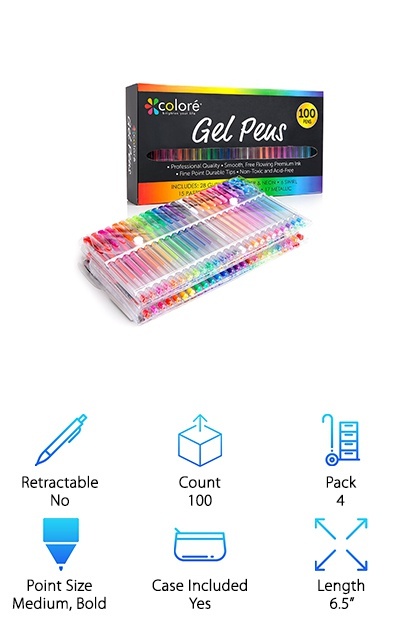 Well, this Reaeon Gel Pens Coloring Set solves the problem of your gel pens running out too early. How do they do it? Well, first they put 20% more ink in each pen. And get this: they give you a refill for every pen! That’s right. This kit comes with 100 pens and 100 refills. It’s a nice variety, too. You get glitter, neon, pastel metallic, fluorescent, and rainbow ink. These pens are smooth and give you a nice, crisp line. Plus, the ink won’t smear or fade. These gel pens are just awesome. The Gelly Roll Stardust Meteor set really looks like a starry night. You get 6 different colors with this set: silver, marine, copper, pink, green, and blue. Each one has a fine glittery, metallic look that makes anything you write look extra special. Address shower invitations, write in your bullet journal, or even take notes in class. It doesn’t matter. Everything you do with this set will look extraordinary. A lot of gel pens look really shimmery when the ink is in the pen but they lose some of that when you get things down on paper. That is not the case with these pens. The ink is archival quality and won’t fade. You can use these pens on light or dark papers and there’s no need to worry if they’ll bleed through. Paper Mate is a well-known brand that’s been around for more than 50 years. While some people might think of Paper Mate as those plain blue stick pens, they’ve come a long way since then. InkJoy is their smoothest line yet and these are one of the best gel pens. First of all, the ink flows really well and that’s not all. It dries 3 times faster than other gel pens. That means less smearing for you. This 8 pack comes with some fun colors: pink pop, red rush, luscious green, teal zeal, bright blue bliss, pure blue joy, charming purple, and jet black. InkJoys are also really nice to write with because of the ergonomically designed comfort grip. That means you can write thank you notes, invitations, or even just doodle a little longer. These Uni-Ball Retractable Gel Pens might be the most stylish pens that we reviewed. Each one is a metallic color with a thick rubber grip and a shiny silver clip. The medium point was designed for smooth writing. That’s not all. Remember that rubber grip we mentioned? It’s also textured to make it even more comfortable to write with this pen. And get this: there’s an ink window so you can see when you pen starts running low and, don’t worry, the ink is refillable. The ink is even specially formulated to eliminate risks of documents alterations and check fraud. Plus, it’s waterproof and fade resistant. You’ll get black, blue, red, green, purple, sky blue, orange, and pink in this set. This would be a great set to take to the office. 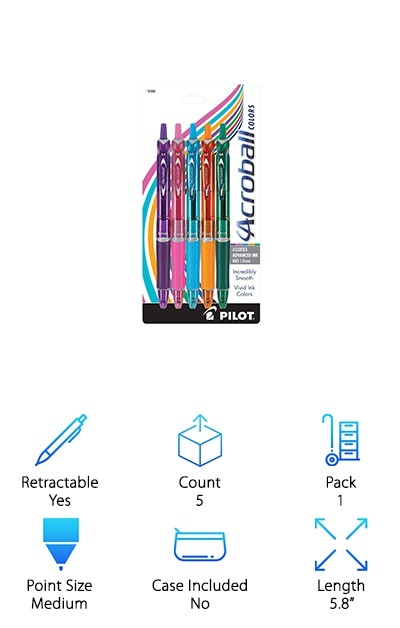 These Acroball Gel Pens from Pilot are actually fun to write with. First of all, they’re really comfortable to hold. The large textured rubber grip is contoured to fit your fingers perfectly. They’re a nice size, too, not too thin and not too wide. Not only does the ink look great on paper, but they’re really smooth to write with because of the fluid way the ink just flows out of the medium-sized tip. And get this: the ink is also smear-resistant. That’s not all. They also come in a variety of colors, including purple, pink, turquoise, orange, and green. You’re going to love this fast-drying, saturates ink. And, when you run out, no need to worry. 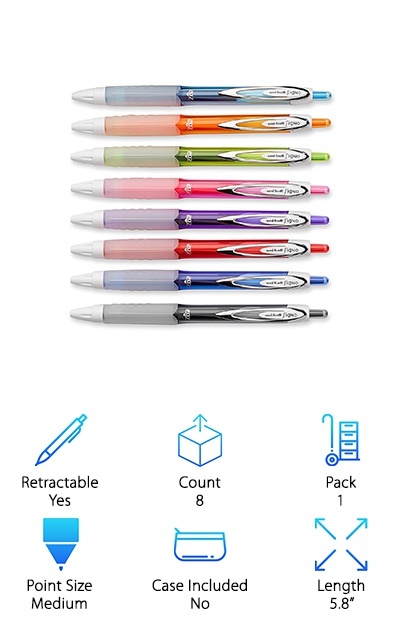 These pens are refillable so when you run of the vibrant ink it’s easy to replace! LolliZ is a fun name for this brand these pens are definitely fun. They’re a great choice if you’re looking for something bright, bold, and maybe even with glitter. There are different varieties in this set, including neon, swirl, glitter, metallic, and milky colors as well as some standard options. These are a great choice for adult coloring books but would also be the perfect way to address cards, write in your bullet journal, or even make a grocery list look a little more glam. 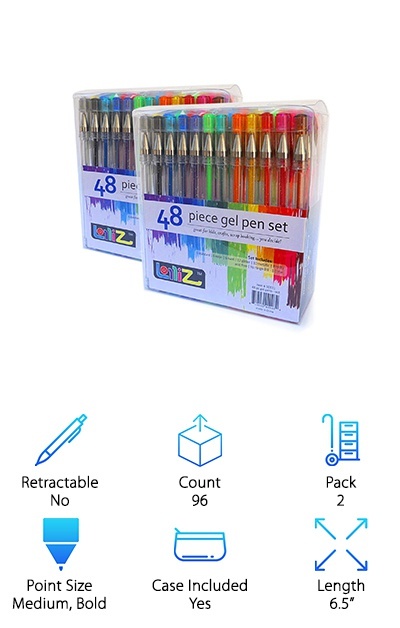 This set is actually 2 sets of 48 pens. Which is great because gel pens run out of ink a little faster than other types of pens by their nature. And you’re going to love these pens so much that you’re going to want to have more when they do run out.